Just as I arrived in Santa Fe for a month of trade and inspiration, an uncontrollable wildfire burst out twelve miles from here in Los Alamos, birthplace of the nuclear bomb. This small city quivers under menacing skies. Air quality levels are tested daily for radioactivity. My friends have packed boxes of their precious things, poised to flee. Through my kitchen window one evening, I watched a round red ball of sun descend behind an apocalypse of smoke. I couldn’t help but scramble to the roof, trying to believe my eyes – it was that ominous, that beautiful, totally unnerving. The next morning, out on a run, I follow paper bag signs to an estate sale, where a gentle man oversees the dispersion of his aunt’s remaining baskets, a coat rack, TVs, a crate of LPs. In the back room of this small adobe house on Canyon Road, boxes of textile remnants flash with color. I kneel and dig, finding treasures of rolled indigo kimono cloth, Guatemalan handwoven stripes, a box of feathers plucked from the land. The lingering presence of this unknown woman, who drew beautiful, humble, hand-made things to her, fills the room. 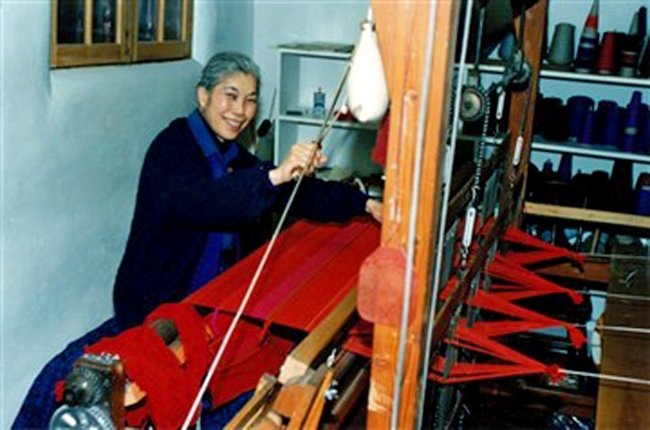 Alice Kagawa Parrott was a weaver, I learn from her nephew, of some renown, with her works in museum collections in Europe and the US. I had no idea. He showed me her weaving studio, nestled in the dust of one of America’s most visited art avenues; four looms, some still warped, surrounded by a chorus of her vegetable-dyed yarns on shelves, now silent. Listening online to her oral history interview with the Smithsonian, I learn that Alice’s Japanese parents, from Hiroshima, immigrated to Honolulu. Her mother worked as a packer in the pineapple plant, her father as carpenter on the railroad, in order to send their daughter to the University and on to elite Cranbrook Art Academy. 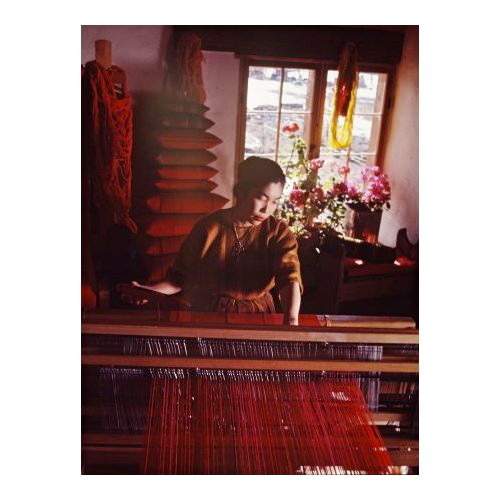 Alice settled in Santa Fe in 1956, in the shadow of the bomb that just eleven years earlier annihilated her parent’s home, killed her aunt, left her cousin mentally ill. She spent a lifetime here, carding fiber, spinning wool, dyeing from local roots, weaving connections. She taught her craft, sold storefront what she loved, cooked up large dinners for friends. She married and adopted two Navajo boys. She won grants and traveled to India, to Guatemala, to the great cultures of cloth, and brought home handwoven treasures, which sit right now in a pile on my desk, beside me. How can I explain my feet turning up Canyon Road, following paper bag signs, drawn to an empty adobe meeting house? How could I have known this woman would leave me remnants of her imaginative life, her daily, intimate courage spinning life under the shadow of death, creating kindness, cooking up beauty? How do you know when you may inherit a box of precious things, after life has fled away, and want to make something new of them? That serendipity is the surprise of life meeting you under the shadow of clouds? Even with the detonating illness mushrooming in my father’s body, day after day, in the midst of it, he gathers loose threads, makes connections, weaves with words. He radiates generosity, he counts the blessings of the day, shines like the red sun behind the clouds. Sometimes, the illness is ominous; sometimes what it has made of him is beautiful; often, the whole business is unnerving. Great clouds of unknowing hover over us everywhere. We are in the throws of a great climatic shiver: floods, tornadoes, droughts, tsunamis that leave us shaken, stirred, awake. I pick up some of Alice’s threads, some of my father’s words; I braid them together. This is the work they have given me, work that I will carry on. Making connections. Bearing the shadow. And creating, I hope, red and fearless as the sun. ~ by Susan on 07/01/2011. Stunned and awed at this Amazing.Lucrative/luminous.Serendipity, then again, life unravels its threads in mysterious ways. It’s up to us to follow them, or to have eyes open enough to find them. So happy to meet Alice. To know her remnants have a new life, a perfect new home. That her story is now woven into ours by the magic of a jog, a blog, an illness, and the warp and weft of friendship. may your fire burn bright (but that wild fire behave!) Off to banff tomorrow. Eyes open. Beautiful, mysterious, poignant, Susan. I’m deeply moved and glad for you that the Canyon Road run guided you to a sister weaver who left you a treasure trove of fabric and feathers. Takes my breath away. I still own and wear a wonderful, colorful vest that I bought from Alice Parrott’s shop on Palace Ave. about forty years ago. The colors are as vibrant as the day I bought it. I’ll wear it again to the Santa Fe Opera next Wednesday. Can you be THE David Sweetkind I knew in Athens,GA? Please email me at yidlfidl@mac.com – I’d love to be in touch!!! Susan, thank you for your moving and heartfelt thoughts from that day. I remember it well, but never imagined that it would be so beautifully chronicled from someone else’s perspective. A very fitting tribute to my aunt Alice Parrott. If you’re interested in seeing some photos of her and some of her work here’s a slideshow we did for her memorial service, along with some of her favorite songs. Hello, this is Karen from Edmonton, Alberta, Canada again. Thank you for forwarding the moving slide show of Alice’s life and work. I so enjoyed seeing her beautiful face at the various stages of her life and it appears that her work became more vibrant and colorful as her life evolved. The cape that I have is all in earth tones with an ochre colored stripe running through greys and beiges. I treasure it. If anyone knows more about what stage of her life this cape is made it I would really appreciate it. I am sure it was made with natural dyes of maybe the walnut, onions etc. Thank you again for sharing such a lovely tribute! Karen, I’m very happy that you are enjoying the cape that was made by my aunt Alice Parrott. I’d love to have a photo of it if you are able to send one.